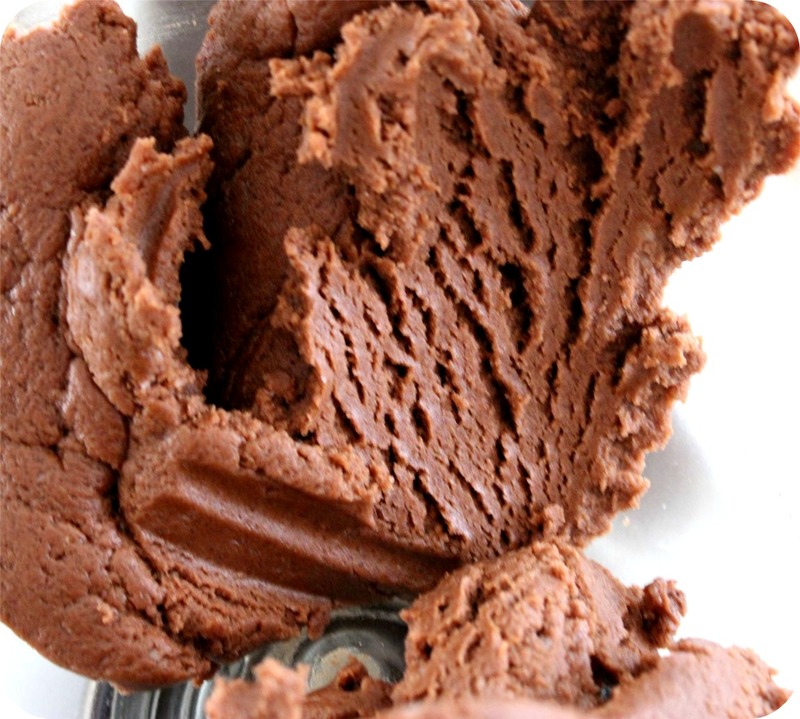 31 Days of Dark Chocolate Peanut Butter? Let’s make that 32. Keep reading all the way to the bottom, people. This is going to get good! Oh, baby. This is the good stuff. It’s my super-duper favorite. For real. The cookbook is amazing. As I flipped through it, I kept squealing “Oooo! I’ll make that! I’ll make THAT, too!” So many drool-worthy recipes to choose from. I’m seriously thinking of trying the dark chocolate peanut butter flourless cake first. Then maybe the marble pound cake. Or maybe ALL OF THEM. 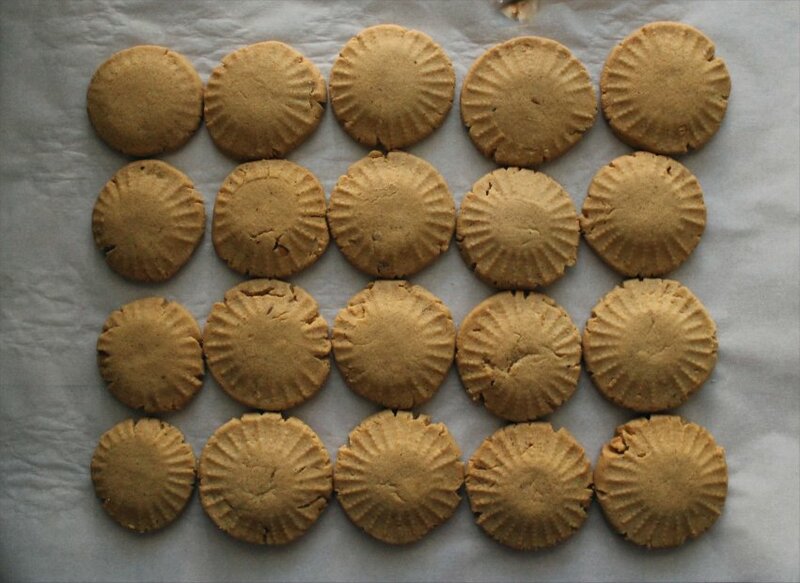 First, though, I jumped in to make a batch of my new favorite peanut butter cookies. They’re made with coconut oil instead of butter (I know… I know… I love butter, too) but the coconut oil adds great flavor and I love the texture of these. 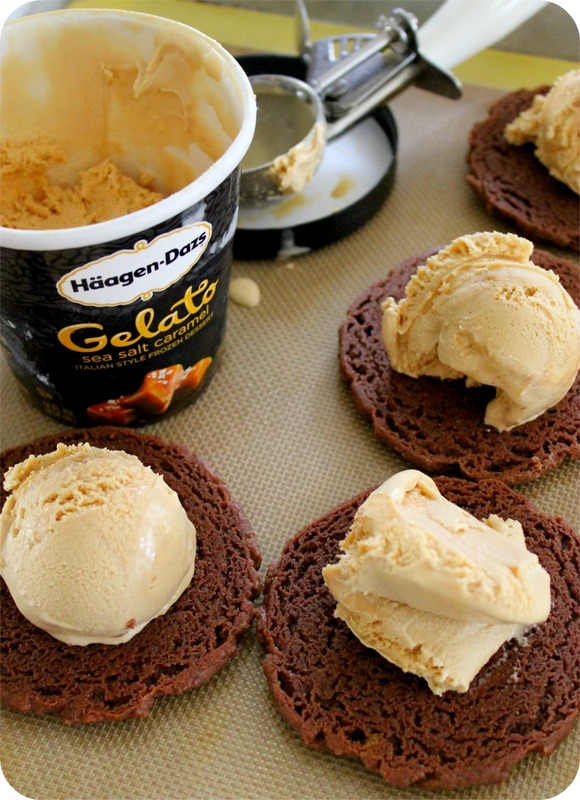 Even better, you can stuff them with Häagen-Dazs Salted Caramel Gelato and BAM! 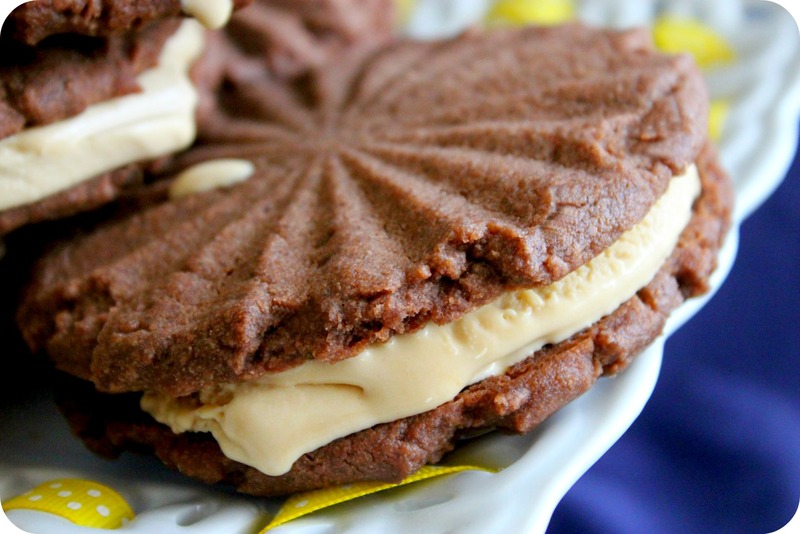 – ice cream sandwiches to die for. Let’s start with the cookies first. Pre-heat your oven to 350F. Make sure your coconut oil is softened to the consistency of softened butter (I had to microwave mine for 12 seconds). It sounds insignificant, but making sure your coconut oil is not too firm or too melted is key to the texture of these cookies. 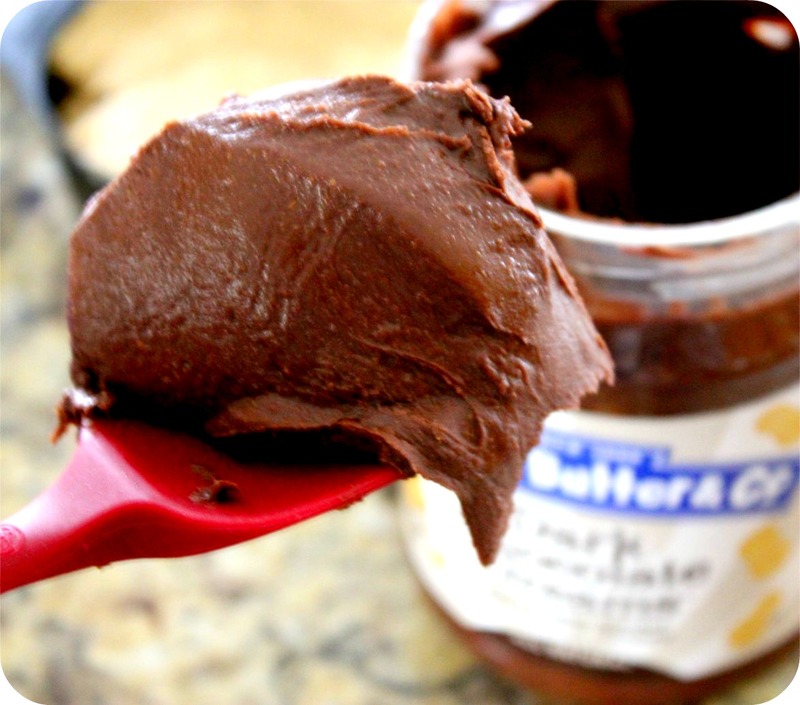 When you’re there, combine the peanut butter and coconut oil and beat for 3-4 minutes with an electric mixer. Scrape down the sides of the bowl, add the vanilla extract, and beat for 30 seconds more. 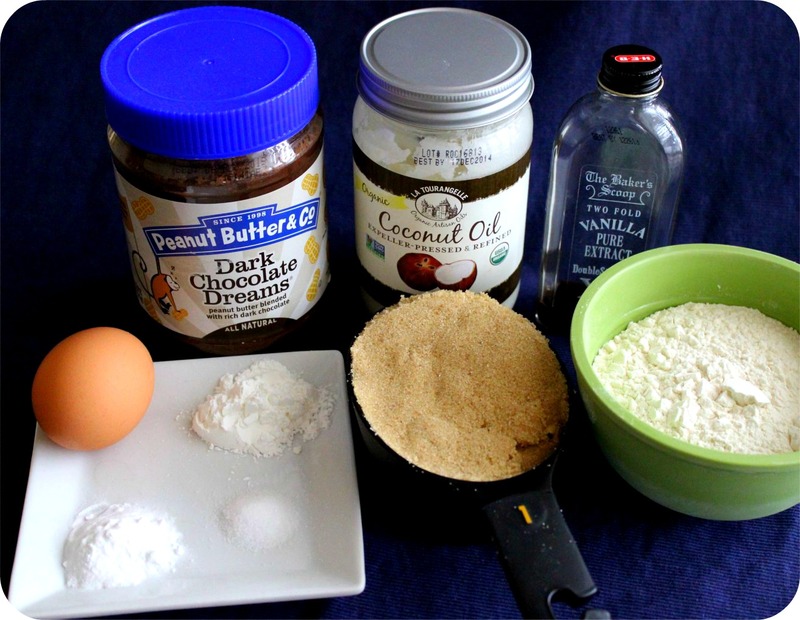 If the mixture is too dry and crumbles easily, add a little more coconut oil and beat it again. If it seems too sticky and doesn’t easily form into a ball, add more flour – 1 to 2 tablespoons at a time – until your dough is the consistency of a new can of Play Dough. 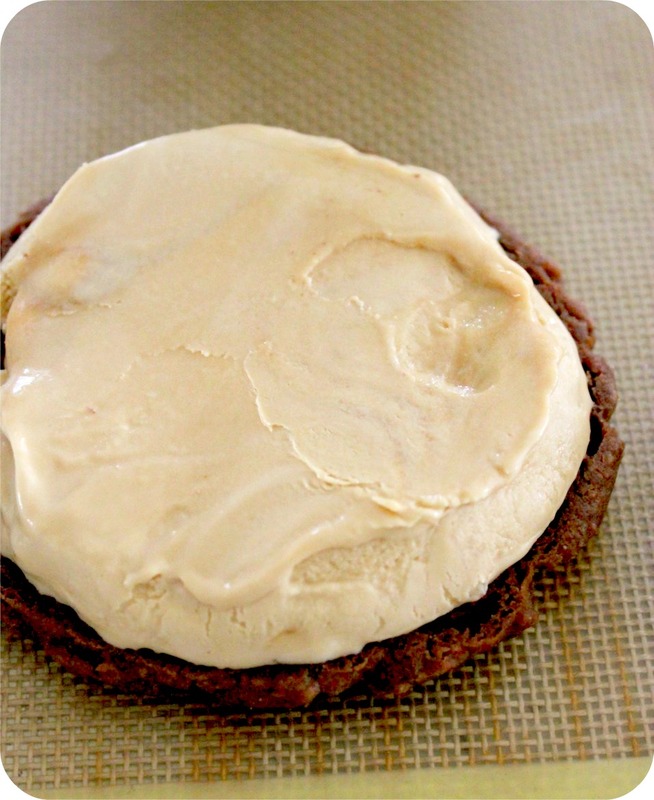 When it’s ready, grab a medium ice cream or cookie scoop and your baking sheets. I recommend using silicone baking mats for most baking projects. They guarantee your hard work won’t stick to the pan, causing violent bouts of cursing or childish hissy fits (or so I’ve heard). That, my friends, is a perfect scoop. To get it, I simply drag the scoop through the dough then scrape it up the side of the bowl as I remove it. See how the dough presses perfectly into the scoop? That’s when you know it’s the right consistency. 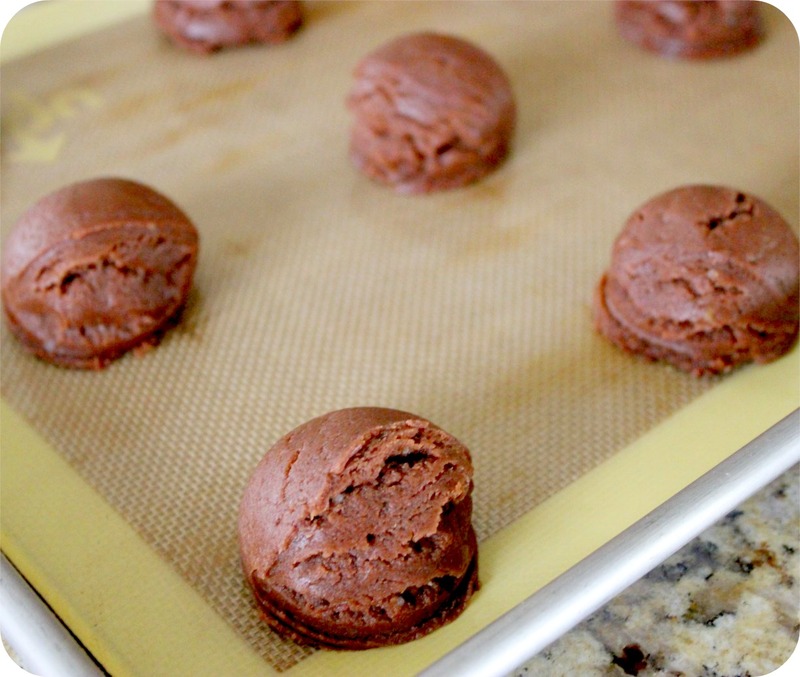 Scoop onto lined baking sheets, 2″ apart so you can press them. Note: if you don’t want to press these cookies flat for ice cream sandwiches, you can leave them like they appear in the above photo. They will take 2-3 minutes longer to bake, but result in a thicker, brownie-like cookie. For ice cream sandwiches, I pressed them with the bottom of an old glass candy dish. I love the pattern this makes in the cookies. If you don’t have a fancy cookie press, I highly recommend flipping over old decorative bowls or glasses. 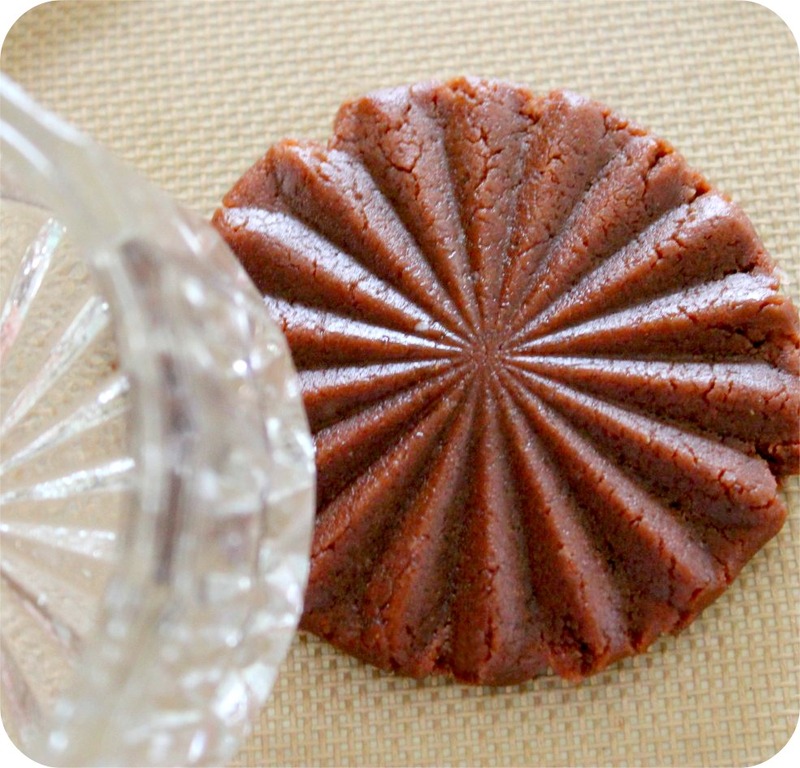 If there’s a great pattern in the bottom, it can be used as a cookie press. Be adventurous and try it! Bake at 350F for 9-10 minutes. Remove from the oven and allow the cookies to cool completely before removing them from the pans. Because I was making ice cream sandwiches with mine, I let the cookies cool completely on the pan, then popped the entire pan in the freezer to make sure they were super cold. Grab a pint of your favorite ice cream or gelato and let it sit out on the counter until it starts to get nice and soft (about 5 mins). I happened to have a pint of Häagen-Dazs Salted Caramel Gelato in my freezer (lucky girl! ), but Ben & Jerry’s Cherry Garcia or Coffee Coffee Buzz Buzz Buzz, or any flavor you love will work. Using the same scoop I used for the cookie dough, I placed a row of cookies ‘bottoms up’ on my tray, then placed a scoop of softened gelato in the center of each. With a flat metal spatula, aka pancake flipper, I flattened each scoop of gelato into a smooth, even layer. Top with a second cookie and immediately wrap in plastic wrap. Pop them back into the freezer for at least 2-3 hours, or until they are frozen solid. To eat, just unwrap and dig in. If you plan to nibble them one at a time, place the wrapped ice cream sandwiches into an airtight container with a tight-fitting lid. They should keep for at least 4 weeks in your freezer. 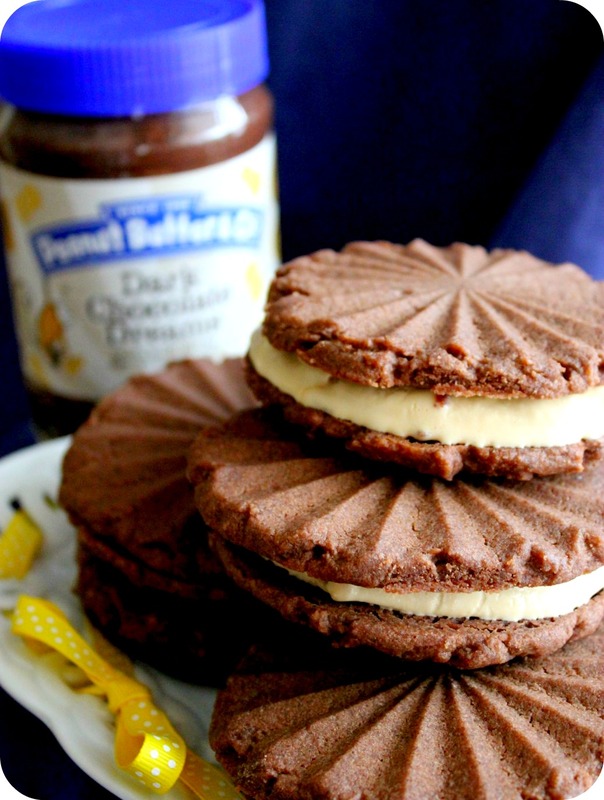 This recipe makes 16 individual cookies approximately 3″ in diameter, or 8 ice cream sandwiches. 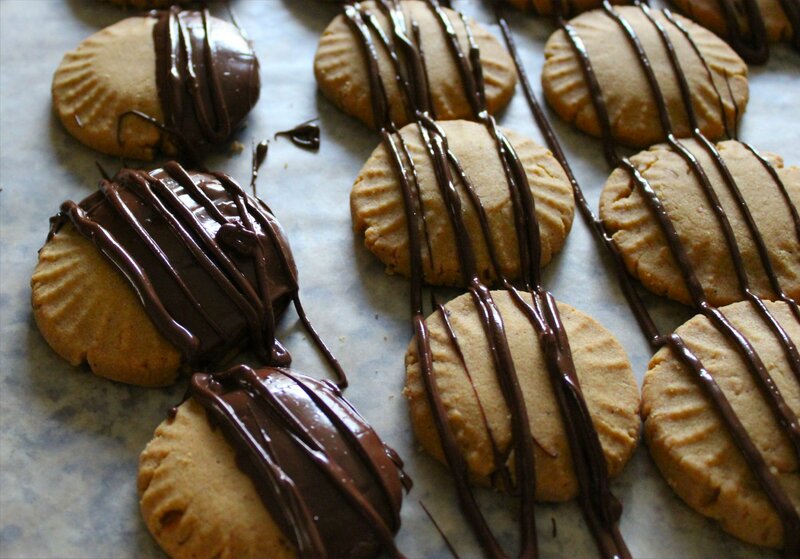 Of course, you can also use a small cookie scoop and make these more bite-size for portion control. Or you can double the recipe and keep the baked cookies in the freezer in an air-tight container so you can enjoy them plain or build ice cream sandwiches on demand. Or just eat the cookies and wash them down with a glass of milk. That works, too. But I recommend the ice cream sandwiches. Because more is more, or something like that. 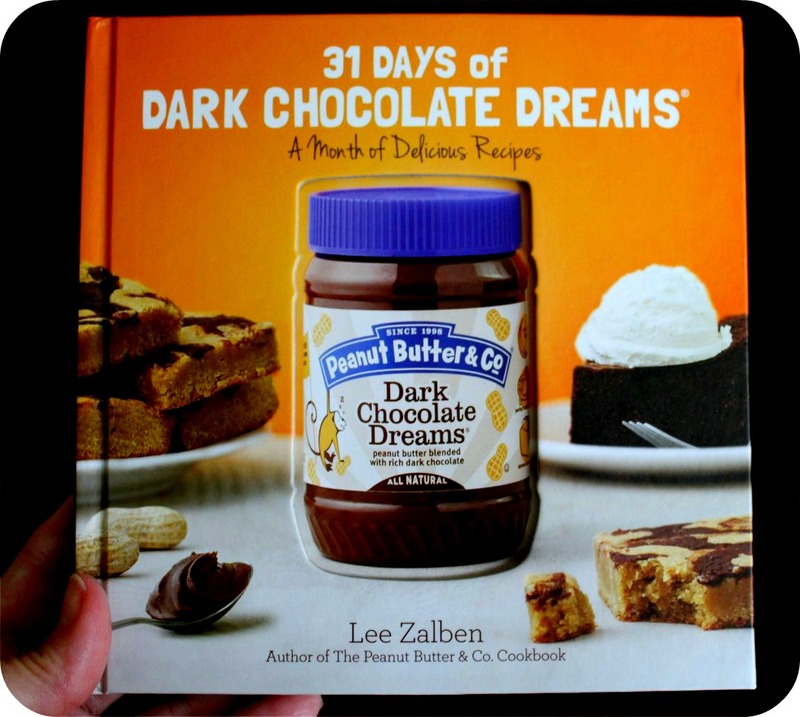 Now for the best part of this post – Peanut Butter & Co has generously offered to ship a copy of ’31 Days of Dark Chocolate Dreams’ and a 28-ounce jar of Dark Chocolate Dreams peanut butter to one lucky reader. To participate, simply leave a comment. 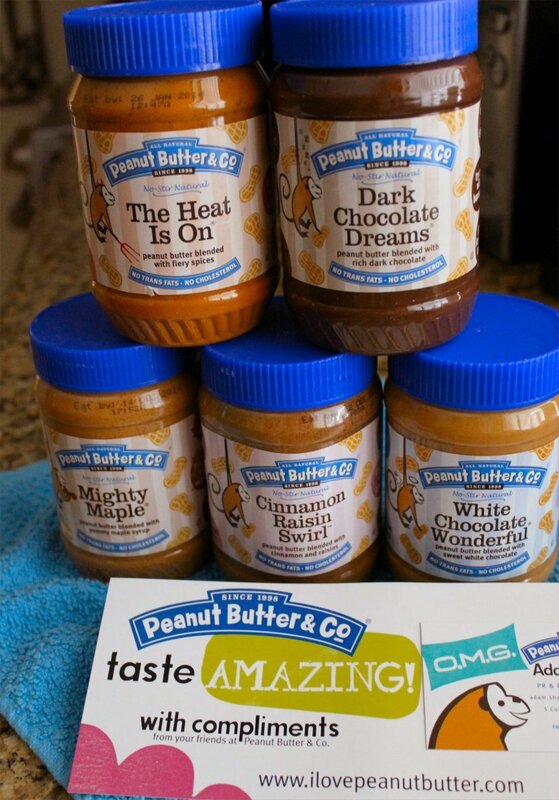 It could be “I love peanut butter!” or “Peanut Butter & Co is awesome!” or even “I’m a cookbook hoarder.” One reader will be chosen at random, and Peanut Butter & Co will ship this tasty prize pack directly to their door. The deadline for this drawing is Friday, February 7th at 12:00 midnight, Central Standard Time, so jump on it now. Right now! What are you waiting for?! If you don’t win or can’t wait to get your hands on the cookbook, you can purchase it online by clicking HERE, along with other Peanut Butter & Co goodies and peanut butter products. The Cinnamon Raisin Swirl blows my mind and Mighty Maple is both creamy and dreamy. Disclaimer: This is not a paid post. Peanut Butter & Co sent me an advanced copy of the cookbook and a jar of peanut butter to play with, as stated above. I am a member of their Yum Squad, which is also unpaid. Put simply, I love their products, and they have occasionally sent me peanut butter to experiment with. 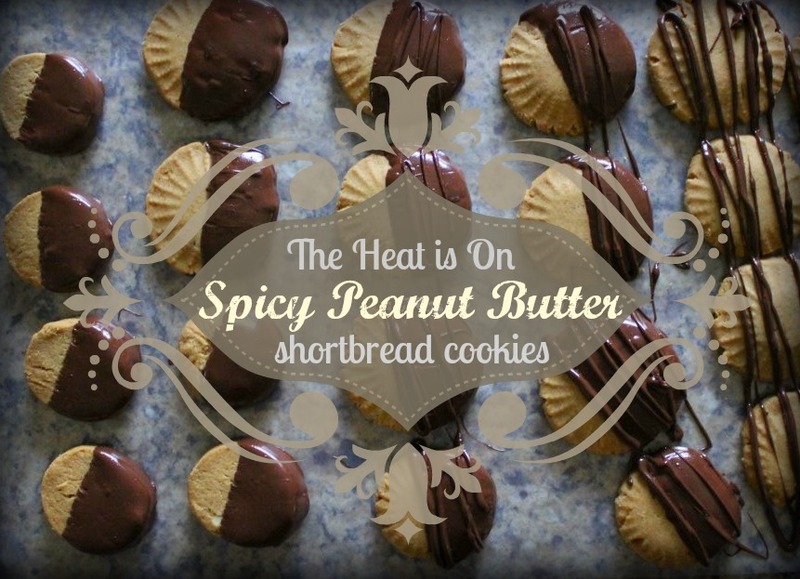 For example, check out my ‘The Heat is On’ Spicy Peanut Butter Shortbread Cookies made with their spicy chili-laced peanut butter. As always, all opinions are my own and are not influenced in any way by the company. I just love the quality of their stuff, and enjoy sharing that joy with you. I love peanut butter. This one time, in high school, a friend’s dad got me to run 5 miles for a giant jar of it on a dare. It was 1980, and there was a peanut butter shortage. I did what I had to do. Fast forward to June of this year, when I attended the BlogHerFood conference in Austin. I had the best time and met so many fabulous food bloggers, but I was also fortunate to meet some really nice people from companies represented at the event like Adam Shapiro from Peanut Butter & Co.
Adam & I sat at the same breakfast table the first morning of the conference, but didn’t get a chance to talk. 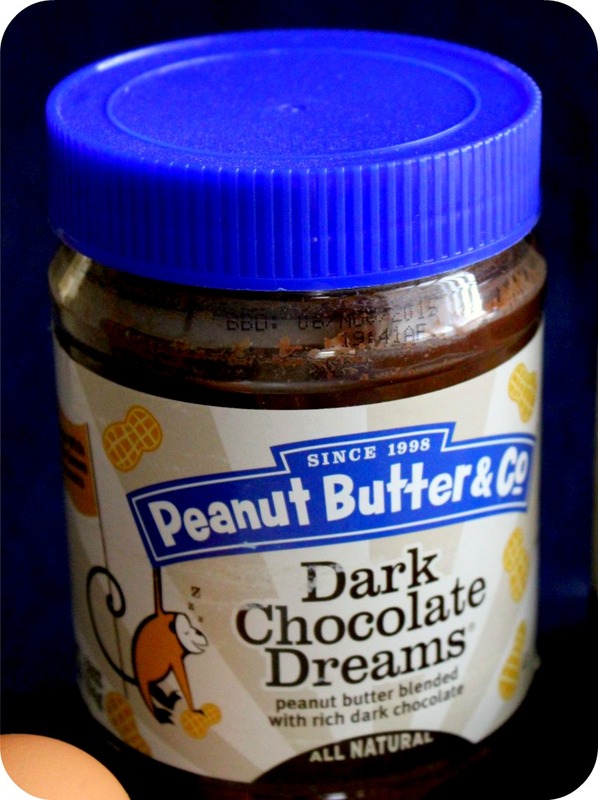 Later that weekend, I bumped into him again and got a chance to strike up a conversation and share how much I love their peanut butter (most especially their Dark Chocolate Dreams – it’s sin in a jar). Adam asked if I’d heard about their new flavor – The Heat is On. It’s a crazy blend of peanut butter and spicy chilies. When I say crazy, I mean crazy genius. We talked about the standard things that came to mind, like using it in a peanut satay or in a dipping sauce for egg rolls or dumplings. But as we were talking, I kept thinking about what it would be like in a cookie. 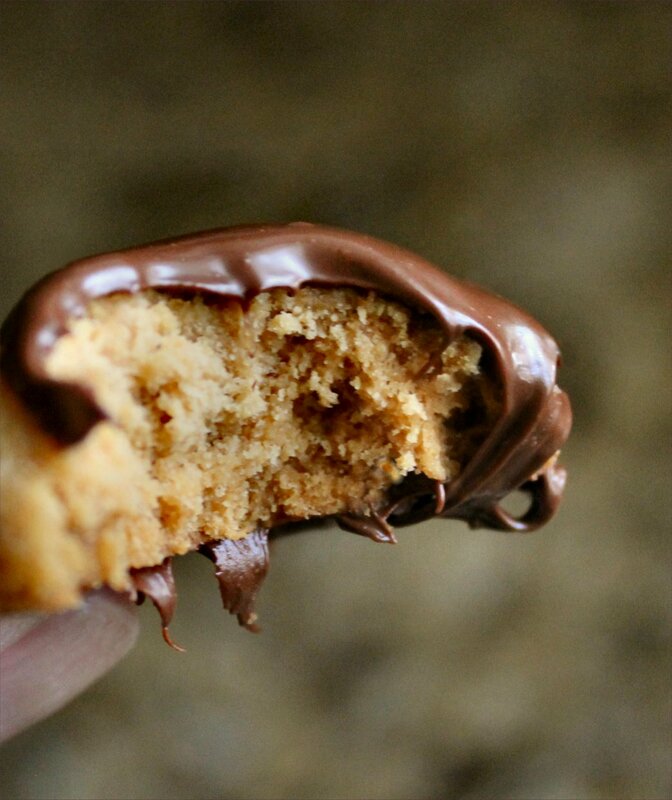 Specifically, a peanut butter shortbread cookie dipped in chocolate. Not just one jar, but an entire box of various Peanut Butter & Co flavors. I was simultaneously stunned and thrilled. He even included a jar of the Dark Chocolate Dreams. What a guy! Lilly Bug (our granddaughter) immediately fell in love with the dark chocolate peanut butter. She’s a girl after her Nana’s heart. Jonah Bear (our grandson) loved the maple. He’s a pancake kind of dude, so that’s not really surprising. Personally, I went into that jar of Cinnamon Raisin Swirl with a spoon and almost didn’t come back out. I’m officially obsessed with it. But this spicy The Heat is On is what inspired these cookies. 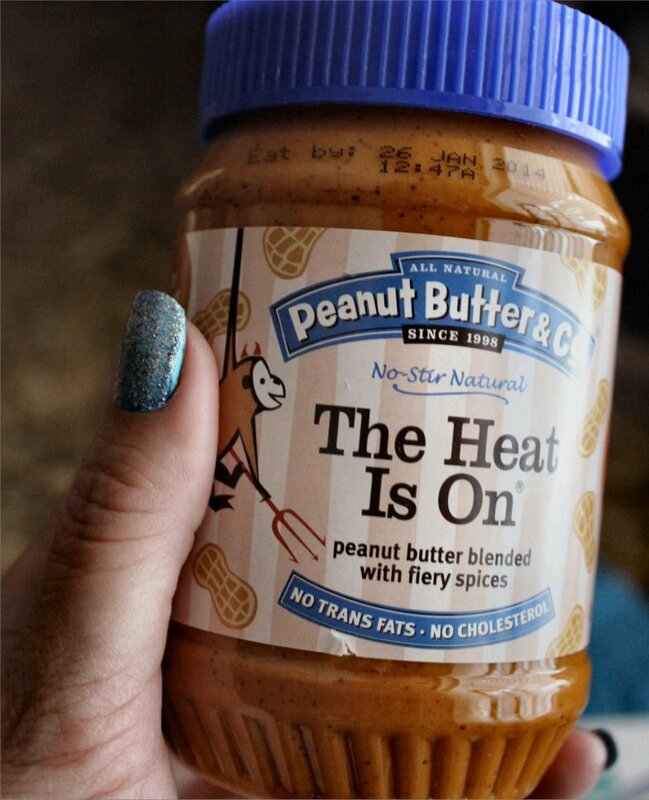 This richly roasted peanut butter combined with a spicy blend of heat is as bold as it is fun. It’s just spicy enough to feel the burn spread across your palate, but not so spicy you’re running for a glass of water. It’s a party in a jar, and now it’s a party in a cookie. And all because I stepped out of my comfort zone and initiated a conversation with a super guy who just happened to work for a peanut butter company that I love. In a large mixing bowl, combine the butter and peanut butter, beating with an electric mixer until well blended. Add the brown sugar, honey or agave nectar and vanilla extract, beating until combined. Sift together the flour and salt and add it slowly to the butter mixture, beating until the flour is fully absorbed. Scoop enough dough into the palm of your hand to form a ball roughly the size of a golf ball. Line a cookie sheet with a Silpat baking mat or parchment paper. Space the balls of cookie dough about 2″ apart and press with the bottom of a decorative glass. If the glass tries to stick to the dough, dip it in granulated sugar. Shape the cookie dough into a log and roll in plastic wrap, twisting the ends to seal them shut. Refrigerate at least one hour, then unwrap and slice into 1/4″ slices. 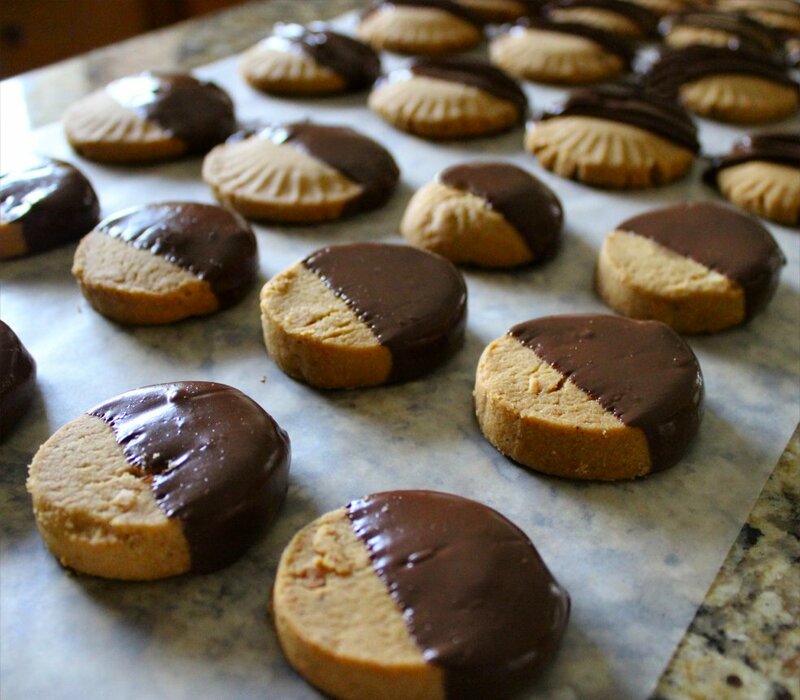 Place the cookies 1″ apart on a lined cookie sheet. Pre-heat your oven to 275F. Place your oven rack in the middle portion of the oven, and bake the cookies for 40 minutes. Remember – everyone’s oven is different and some run hotter than others. Start checking the cookies at 30 minutes. If you gently press the center of the cookie and it gives a little, let them stay in a few minutes longer. I baked mine for exactly 40 minutes. 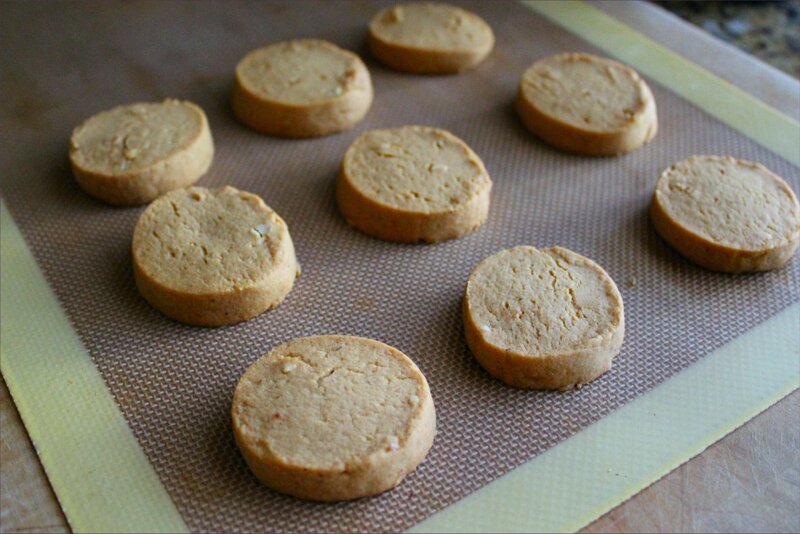 Remove from the oven and allow them to cool on the baking sheets until completely cooled. Store in an airtight container for up to one week. If you want to kick it up a notch, consider dipping them in chocolate. I did. #NoRegrets. I let the cookies cool overnight to make sure they were completely cooled. Next, combine 1/2 cup dark chocolate chips with 3/4 cup milk chocolate chips and set them over a double-boiler to melt. 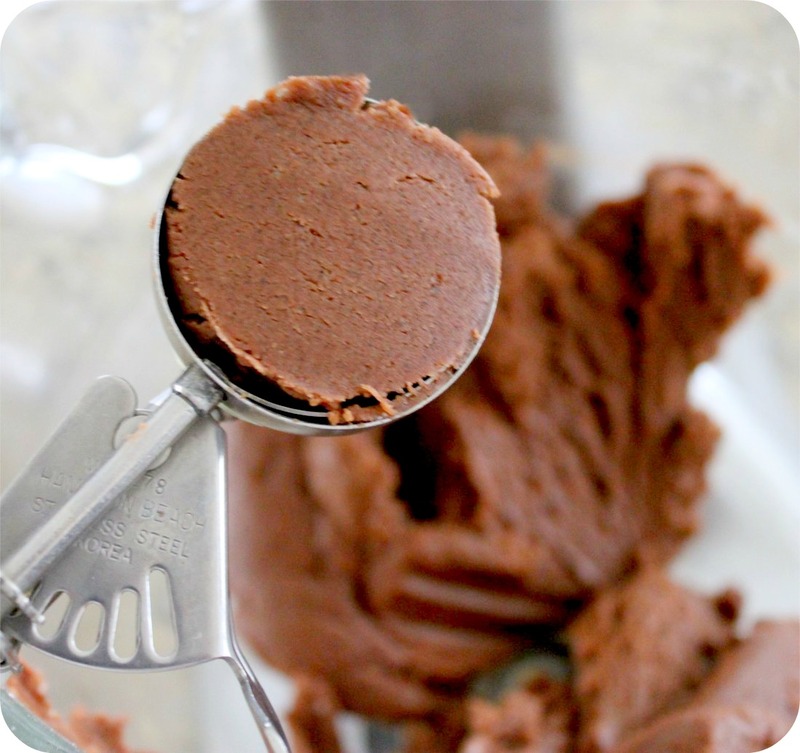 Once melted, whisk until the chocolate mixture is perfectly smooth, with no lumps. Scrape the chocolate into a small glass or ramekin and dip each cookie individually, placing them on waxed paper to set. In a rush? You can scrape the melted chocolate into a zippered plastic food storage bag, press it all down to one corner of the bag, and snip the corner off. Using a quick back & forth method, drizzle the cookies until all are decorated. Then squeeze some into your mouth for good measure, and throw away the used bag. After that, it’s just a matter of waiting for the chocolate to set up, if you can wait that long. I’ve never been good at waiting, especially with cookies. Tip: If you live in a warm, humid climate like I do (hello, Houston), spread your waxed paper onto a cookie sheet before you dip or drizzle your cookies with chocolate. Once done, you can pop the entire pan into the fridge for 30 minutes or the freezer for 10 minutes to help the chocolate firm up. 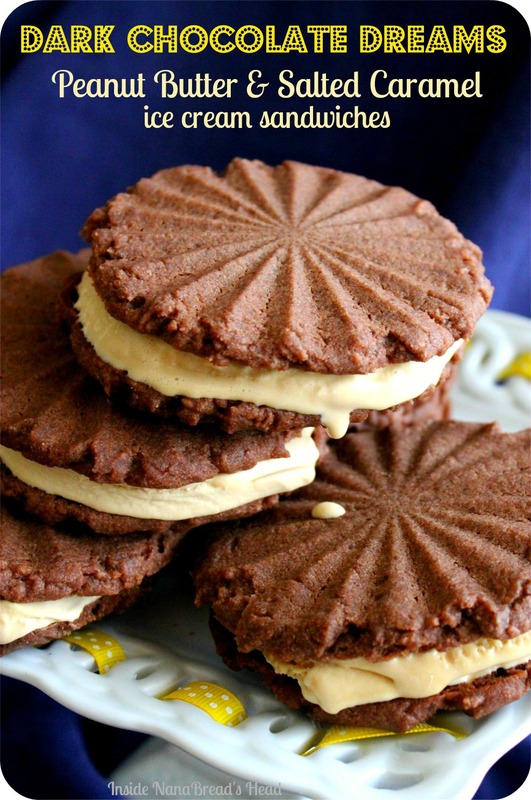 Note: This recipe is adapted from a shortbread recipe at Living Tastefully. 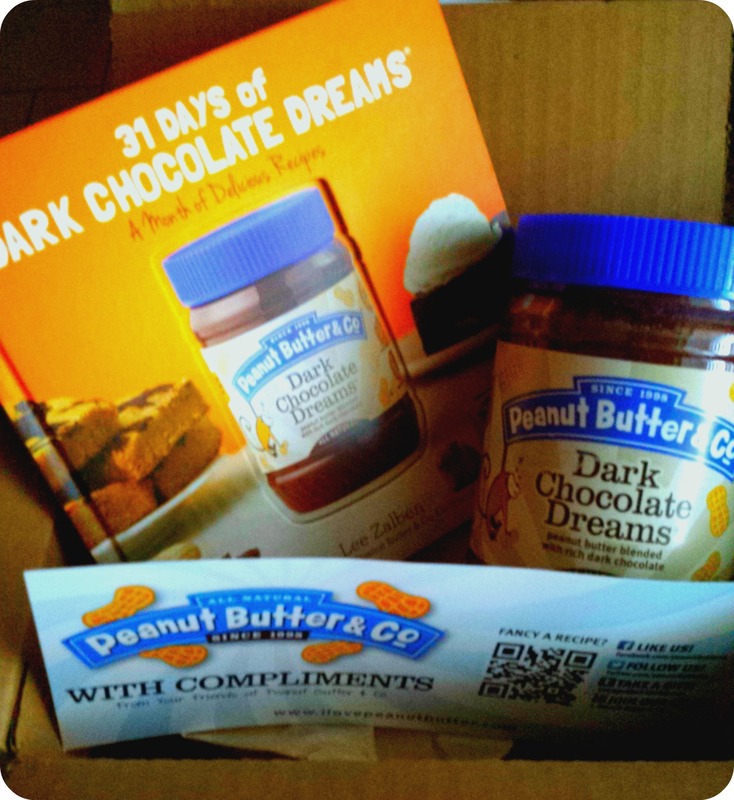 This post is not sponsored by Peanut Butter & Co. As stated above, the company provided me with a box of product to sample. All opinions (and drooling) are my own. Special thanks to Adam Shapiro of Peanut Butter & Co for his generosity.